Earth is experiencing a substantial loss of biodiversity at the global scale, while both species gains and losses are occurring at local and regional scales. The influence of these nonrandom changes in species distributions could profoundly affect the functioning of ecosystems and the essential services that they provide. However, few experimental tests have been conducted examining the influence of species invasions on ecosystem functioning. Even fewer have been conducted using invasive ecosystem engineers, which can have disproportionately strong influence on native ecosystems relative to their own biomass. The invasion of exotic earthworms is a prime example of an ecosystem engineer that is influencing many ecosystems around the world. In particular, European earthworm invasions of northern North American forests cause simultaneous species gains and losses with significant consequences for essential ecosystem processes like nutrient cycling and crucial services to humanity like soil erosion control and carbon sequestration. Exotic earthworms are expected to select for specific traits in communities of soil microorganisms (fast-growing bacteria species), soil fauna (promoting the bacterial energy channel), and plants (graminoids) through direct and indirect effects. This will accelerate some ecosystem processes and decelerate others, fundamentally altering how invaded forests function. This project aims to investigate ecosystem responses of northern North American forests to earthworm invasion. Using a novel, synthetic combination of field observations, field experiments, lab experiments, and meta-analyses, the proposed work will be the first systematic examination of earthworm effects on (1) plant communities and (2) soil food webs and processes. Further, (3) effects of a changing climate (warming and reduced summer precipitation) on earthworm performance will be investigated in a unique field experiment designed to predict the future spread and consequences of earthworm invasion in North America. By assessing the soil chemical and physical properties as well as the taxonomic (e.g., by the latest next-generation sequencing techniques) and functional composition of plant, soil microbial and animal communities and the processes they drive in four forests, work packages I-III take complementary approaches to derive a comprehensive and generalizable picture of how ecosystems change in response to earthworm invasion. Finally, in work package IV, meta-analyses will be used to integrate the information from work packages I-III and existing literature to investigate if earthworms cause invasion waves, invasion meltdowns, habitat homogenization, and ecosystem state shifts. Global data will be synthesized to test if the relative magnitude of effects differs from place to place depending on the functional dissimilarity between native soil fauna and exotic earthworms. Moving from local to global scale, the present proposal examines the influence of earthworm invasions on biodiversity–ecosystem functioning relationships from an aboveground–belowground perspective in natural settings. This approach is highly innovative as it utilizes the invasion by exotic earthworms as an exciting model system that links invasion biology with trait-based community ecology, global change research, and ecosystem ecology, pioneering a new generation of biodiversity–ecosystem functioning research. Anthropogenic activities cause species gains and losses at local and regional scales, although the functional consequences of those two simultaneous processes have been studied mostly in isolation from each other ( Wardle et al. 2011 ). Invasions of natural communities by non-indigenous species are a threat to native biodiversity and are currently rated as one of the most important global-scale environmental problems ( Sala et al. 2000 , Wardle et al. 2011 , Murphy and Romanuk 2013 ). Climate change and human activities may alter the spread and success of exotic invasive species ( Dukes and Mooney 1999, Frelich et al. 2012 ). As a consequence, invasive species can radically transform native ecosystems when they introduce novel traits that are dissimilar from those of the native community ( Wardle et al. 2011 ). Notably, if the functional significance of novel traits is high, such as in the case of exotic ecosystem engineers ( Jones et al. 1994 ), the establishment of novel species can alter the composition and functioning of native communities by selecting for particular traits ( Funk et al. 2008, Wardle et al. 2011 ). Native biodiversity and functions are particularly threatened in boreal and northern temperate forest ecosystems, where biological invasions were recently shown to represent the main drivers of biodiversity loss ( Murphy and Romanuk 2013 ). Much of the focus on exotic species invasions has been on aboveground invaders; however, belowground invasions may gain more interest as more ecologists begin to recognize the importance of links between aboveground and belowground communities ( Wardle et al. 2004, Bardgett and van der Putten 2014 ). Invasion of northern forests by exotic earthworms, for example, is receiving increasing attention ( Bohlen et al. 2004, Hendrix et al. 2008 ), because of their central role as ecosystem engineers in terrestrial ecosystems ( Edwards 2004 ) and because of their functional dissimilarity to the native soil fauna ( Heemsbergen 2004, Wardle et al. 2011 ). The invasion of exotic earthworms often causes nonrandom species losses both above and below ground, providing the possibility to study how realistic biodiversity loss affects natural ecosystems ( Wardle et al. 2011 ). Such studies are not only urgently needed to realistically predict how ecologically significant exotic invasive species will alter the composition and functioning of native ecosystems, but also represent a promising next step in biodiversity–ecosystem functioning (BEF) research (according to Cardinale et al. (2012) being the ‘basis for a new generation of BEF experiments’). Large parts of North America are lacking native earthworm species ( Bohlen et al. 2004 ), presumably due to extirpation of the indigenous earthworm fauna of great parts of North America during the Wisconsinan Glaciation ( James and Hendrix 2004 ). Only few native earthworm taxa survived in refugia with warmer and more humid climates and now are restricted to the Pacific coast, southeastern USA, and parts of Mexico. During the European colonization of North America ~400 years ago, European earthworms were introduced into forests and grasslands, both accidentally and intentionally ( Bohlen et al. 2004, Hendrix et al. 2008 ). Thick organic soil layers, few competitive native earthworm species, and functional dissimilarity to native soil fauna facilitated the successful establishment of nonnative earthworm species in various habitats ( Addison 2009 ). Today European earthworms are common in the eastern and mid-western parts of the USA, the Rocky Mountains in Canada, and some populations exist west of the Rocky Mountains on the Pacific coast ( James and Hendrix 2004, Addison 2009 ); however, a variety of ecosystems still are being invaded ( Hendrix et al. 2008 ). The invasion of northern North American forests is of particular concern as it is a multifaceted problem encompassing biodiversity decline ( Eisenhauer et al. 2007 ), plant invasions ( Heimpel et al. 2010 ), habitat degradation through soil erosion ( Dobson and Blossey 2015 ), leaching of nutrients ( Resner et al. 2015 ), and carbon loss from the soil ( Bohlen et al. 2004 ). Consequently, exotic earthworm invasion threatens a wide range of vital ecosystem services ( Hendrix and Bohlen 2002, Hendrix et al. 2008 ). Earthworms are a major component of many terrestrial ecosystems ( Edwards 2004 ). In nonacidic soils they usually dominate the biomass of soil invertebrates and function as ecosystem engineers ( Jones et al. 1994 ), particularly in forest soils, by structuring the environment of the soil community ( Jouquet et al. 2006 ). Through burrowing, casting, and mixing of litter and soil (bioturbation) they influence aggregate stability, soil structure, infiltration of water, aeration of deeper soil layers, nutrient cycling and mineralization, microbial biomass, and other soil invertebrates ( Brown 1995, Eisenhauer et al. 2007, Eisenhauer 2010 ). These changes have important consequences for plant communities ( Frelich et al. 2012 ), carbon sequestration ( Zhang et al. 2013 ), greenhouse gas fluxes ( Lubbers et al. 2013 ), and soil food webs ( Eisenhauer et al. 2007 ). The direction and size of effects, however, vary with earthworm species, which are categorized into three main ecological groups: epigeic, endogeic, and anecic species ( Bouché 1977 ). Epigeic species reside mainly in the upper organic layers and cause limited mixing of mineral and organic layers. Endogeic species live in upper mineral soil layers mainly consuming mineral soil materials. Anecic species form vertical, permanent burrows and incorporate litter from the soil surface into deeper soil layers. It is therefore essential to consider the functional group identity of invasive earthworms to predict their impact on ecosystems ( Eisenhauer 2010 ). Earthworms are commonly used as model soil organisms in laboratory experiments ( Fründ et al. 2010 ), but are still underexploited as a model for invasion biology ( Hendrix et al. 2008 ). The presence of nonnative earthworms is strongly associated with human activities and infrastructure, such as timber harvesting, forest roads, cabins, and fishing areas ( Beauséjour et al. 2015 ). The functional dissimilarity of earthworms to the native soil fauna ( Wardle et al. 2011 ) represents an empty niche, and the lack of competition thus made earthworms successful invaders of northern North American ecosystems ( Migge 2001 ) with exceptionally high earthworm abundances ( Eisenhauer et al. 2007 ) at the peak of an ‘invasion wave’ ( Straube et al. 2009, Eisenhauer et al. 2011 ). Once introduced, site-level climate, physical and chemical soil properties, and food quality are likely to determine population success and thus effect size of earthworm invasion ( Curry 2004, Fisichelli et al. 2013 ). In addition, earthworm activity is limited by high temperatures and drought stress (). A previous study on the drivers of earthworm invasion across 125 mixed temperate-boreal forest sites across the western Great Lakes region revealed that 93% of the sites showed evidence of earthworm activity, and 49% had high to very high severity earthworm disturbance, highlighting the wide distribution and functional impacts of European earthworms in that region ( Fisichelli et al. 2013 ). Earthworm disturbance was explained by soil pH, precipitation, and litter quality with cascading effects on plant community composition. As climate change may modulate the success of invasive or range-expanding species ( Wardle et al. 2011 ), it is important to understand how a future climate will affect the performance and effects of exotic earthworms ( Frelich and Reich 2009 ). Frelich and Reich (2009) hypothesized that climate warming should accelerate the spread and increase the impacts of invasive earthworms in northern North America. Expected increases in growing season length and the resulting increase in primary productivity are likely to contribute to more rapid earthworm invasions formerly limited by colder temperatures ( Bohlen et al. 2004 ). Warming may, on the other hand, also reduce biological activity by decreasing soil water content, and this may be particularly relevant for earthworms ( Eisenhauer et al. 2014a ). Thus far, there is only one field study on warming effects on exotic earthworm populations in northern North American forests, which suggests that –in contrast to previous assumptions– warming limits the invasion of earthworms by causing less favorable soil abiotic conditions, unless warming is accompanied by increased and temporally even distributions of rainfall sufficient to offset greater water losses from higher evapotranspiration ( Eisenhauer et al. 2014a ). An important next step would be to study how warming and precipitation interact in influencing exotic earthworms and their effects on ecological communities and functions as climate projections for that region predict warmer temperatures and reduced summer precipitation ( Karl et al. 2009 ). Northern temperate and boreal forests in North America developed over most of the past 10,000 years, since the last Pleistocene glaciation, in the absence of earthworms ( James and Hendrix 2004 ). In general, effects of earthworms are regarded as positive for plant growth ( Scheu 2003 ) and plant diversity ( Eisenhauer et al. 2008 ). Similarly, earthworms form structures in soil that can increase the spatial heterogeneity and thereby the diversity of soil communities ( Eisenhauer 2010 ). However, earthworms may exert contrasting effects on ecosystems that developed in their absence ( Bohlen et al. 2004, Eisenhauer et al. 2007, Frelich et al. 2012 ). Although the ecology of earthworms has been studied in detail (e.g., Edwards 2004, Fründ et al. 2010 ), remarkably little is known about their impacts as invaders on native ecosystems. To our knowledge no published study has explicitly tested effects of exotic earthworms on ecosystems devoid of earthworms by manipulating densities in the field, and the vast majority of existing literature is based on observations of presumed invasion fronts ( Migge 2001, Szlavecz et al. 2011 ). However, those observations may covary with unknown environmental gradients, and experimental tests are urgently needed to infer causality. While the study by Migge (2001) has not been published in international peer-reviewed journals, Szlavecz et al. (2011) extracted earthworms from upland forests at SERC (Chesapeake Bay, US), which have native earthworm fauna. Further, while some studies reported on changes of plant (e.g., Holdsworth et al. 2007 ) and soil communities (e.g., Burke et al. (2011) ) along observational invasion fronts, causal linkages between shifts in plant and soil communities have rarely been linked to alterations in ecosystem functioning. The presence of exotic earthworm species is likely to have profound effects on the native flora and fauna ( Fig. 1 ; Bohlen et al. 2004 ), because they significantly influence nutrient cycling, plant growth and diversity, tree seedling density, fine root biomass, soil seed banks, soil microbial biomass and functions and densities of other soil organisms ( Hale et al. 2005, McLean et al. 2006, Migge-Kleian et al. 2006, Eisenhauer et al. 2007, Eisenhauer et al. 2009a, Holdsworth et al. 2007 ). Flora and fauna of deciduous forests of North America are adapted to thick organic layers, which get eliminated by exotic earthworms ( Hale et al. 2005, Eisenhauer et al. 2007 ) placing a novel filter on the success of tree and herbaceous plant species and soil organisms ( Frelich et al. 2012 ). Significant consequences of earthworm invasions could even be detected in several vertebrate species, such as native salamanders ( Ransom 2011 ), ground-nesting birds ( Loss and Blair 2011 ), and deer ( Fisichelli et al. 2013 ). Extreme example of the potential consequences of earthworm invasion. Shown is a maple forest in Minnesota, USA, which has not yet been invaded by exotic earthworms (top), and another maple forest in that region that has been invaded by European earthworms (bottom). Please note that direct comparisons of those two forest stands are complicated and it is hard to identify cause and effect. Experimental manipulations are needed to study earthworm effects. Photo credit: Olga Ferlian (top) and Ulrich Pruschitzki (bottom). Observational studies suggest that the invasion by exotic earthworms paves the way for subsequent invasions of plants and other organisms ( Tiunov et al. 2006, Nuzzo et al. 2009 ) causing invasion meltdowns ( Heimpel et al. 2010 ). The underlying mechanisms can be multifaceted ( Frelich et al. 2012 ), such as disruption of associations between native plant species and mycorrhizae ( Lawrence et al. 2003 ), changes in the composition of soil seed banks ( Eisenhauer et al. 2009a ), direct interactions between earthworms and seeds or seedlings ( Eisenhauer et al. 2010a, Forey et al. 2011 ), changes in litter cover ( Eisenhauer et al. 2012b, Roth et al. 2015 ), and increased drought stress ( Whitfeld et al. 2014, Dobson and Blossey 2015 ). In preparation for this proposal, we established a database of previously published work to synthesize existing data on the effects of exotic earthworms on the aboveground and belowground biodiversity of northern North American deciduous forests (see Methodology for details). A recent meta-analysis based on this database found that earthworm ecological group richness, density, and biomass increase the cover of graminoid plants, while herbaceous and woody plants do not change in cover ( Craven et al. 2017 ). This is likely due to the fact that graminoids are more efficient than herbaceous species in acquiring nutrients from the soil ( Eisenhauer and Scheu 2008 ) and suffer less from direct interactions with earthworms ( Eisenhauer et al. 2010a ) indicating a novel environmental filter in northern North American forests ( Frelich et al. 2012 ). Additionally, earthworm ecological group richness decreased overall plant species Shannon-Wiener diversity, and earthworm biomass significantly increased the cover of non-native plants ( Craven et al. 2017 ), indicating the potential severity of earthworm invasion impacts on previously uninvaded ecosystems. A second meta-analysis based on our database found that the presence of earthworms decreased the density and diversity of soil invertebrate communities ( Ferlian et al. 2018 ). These results suggest that exotic earthworms significantly change the functional composition and diversity of plant and soil animal communities. Although this is – to the best of our knowledge – the most comprehensive dataset on the consequences of earthworm invasion for native communities that will allow novel insights, it also suffers some limitations, such as the limited capacity to clearly separate effects of single ecological groups, calling for a continued effort to establish collaborations to integrate more data (see workshop) and for the experimental test of the consequences of earthworm invasion for ecological communities and functions. Although we found a significant reduction in soil invertebrate diversity in the presence of exotic endogeic earthworms, the data coverage remains insufficient to derive information on the trait composition and functional alterations of soil food webs. Results from a global change experiment in Germany (Hohenheim Climate Change Experiment [HoCC]), however, suggest major impacts of earthworms on the topology of soil food webs with effects depending on soil temperature ( Siebert et al. 2019 ). In the HoCC experiment, soil temperature and earthworm densities were manipulated in an agricultural field, and soil organisms (soil microorganisms, protozoa, nematodes, micro- and macroarthropods) and food web properties were studied. We found that earthworm effects on soil food webs depended on the temperature treatment with high earthworm densities significantly decreasing the number of trophic positions at ambient temperature, but not at elevated temperature, and higher earthworm densities substantially reducing connectance and the number of top species at elevated temperature, but not at ambient temperature. Further, the slope between body mass and abundance coincided with Damuth’s rule ( Damuth 1991 ) very well (-0.758), but deviated substantially at high earthworm densities and elevated temperature (-0.265). These results suggest that earthworms favored larger soil fauna but not small species, which is also in line with some studies on exotic earthworm effects in North America ( Eisenhauer et al. 2007, Schlaghamerský et al. 2014 ), where mostly small soil microarthropod taxa suffered from earthworm presence. This is likely to cause substantial changes in ecosystem functioning ( Schlaghamerský et al. 2014 ). The responses of ecosystem functions and services to earthworm invasion have rarely been assessed thus far. The most commonly reported process is litter decomposition, which is typically considerably increased by the presence of earthworms ( Hale et al. 2005 ). Other studies suggest changes in soil carbon dynamics and storage ( Bohlen et al. 2004 ), elevated levels of soil erosion ( Dobson and Blossey 2015 ), increased leaching of soil nutrients ( Resner et al. 2015 ), and changes in soil microbial respiration ( Groffman et al. 2004, Eisenhauer et al. 2007, Eisenhauer et al. 2011 ). Invasive earthworms cause a significant decline in plant and soil biodiversity ( Craven et al. 2017, Ferlian et al. 2018 ) , which is likely to have important consequences for aboveground-belowground interactions and ecosystem functioning ( Cardinale et al. 2012 ). Recent studies suggest that plant diversity is a significant predictor of soil microbial and animal densities and diversity ( Scherber et al. 2010, Eisenhauer et al. 2013 ), which in turn drive important ecosystem processes ( Ebeling et al. 2014 ) and services ( Cardinale et al. 2012, Pérès et al. 2013 ). The functional dissimilarity of soil organisms –not species richness per se – seems to be most relevant for ecosystem functioning ( Heemsbergen 2004 ). Remarkably, in the study by Heemsbergen (2004) functional dissimilarity effects were mostly due to the presence of (two) earthworm species (Lumbricus rubellus and Aporrectodea caliginosa). As both species are widespread invaders of northern North American forests ( Eisenhauer et al. 2014a ), it is likely that their functional uniqueness will cause drastic effects on native ecosystems ( Wardle et al. 2011 ). Information on exotic earthworm effects on soil microbial communities is scarce, while several studies reported responses of total soil microbial biomass ( Ferlian et al. 2018 ). It is assumed that earthworms favor smaller, but more active soil microbial communities with a potential shift from more fungal to bacterial-dominated communities ( McLean et al. 2006, Eisenhauer et al. 2011 ). In sum, the invasion by exotic earthworms can serve as an exciting model system ( Hendrix et al. 2008 ) that links invasion biology, trait-based community ecology, global change research, and ecosystem ecology, pioneering a new generation of biodiversity–ecosystem functioning research ( Wardle et al. 2011, Cardinale et al. 2012, Bardgett and van der Putten 2014, Tilman et al. 2014 ). Earthworms invade ecosystems in dynamic waves, inducing nonlinear alterations of communities and processes ( Straube et al. 2009, Eisenhauer et al. 2011 ; Fig. 2 A). We expect to observe a decline in the taxonomic and functional diversity of plant and soil communities in response to earthworm invasion (Hypothesis 1; Frelich et al. 2012 ), followed by a mild recovery after the invasion wave ( Fig. 2 B; Straube et al. 2009 ). Some inconsistent results in previous studies might be due to difficulties in detecting where the forest patch lies on the trajectory of an earthworm invasion. The overall decrease in functional diversity is probably due to the selection for particular traits of plants and soil organisms (H2; Frelich et al. 2012, Schlaghamerský et al. 2014 ). More specifically, soil energy channels will shift from a fungal to a bacterial-dominated system ( Fig. 2 C; Eisenhauer et al. 2011 ), and soil animal communities will shift towards larger-bodied species being able to withstand physical disturbance ( Frelich et al. 2012, Schlaghamerský et al. 2014 ). Soil microbial communities will show low nutrient limitation at the invasion front, while they will be nitrogen-limited after the invasion front. By changing abiotic conditions, such as soil water content by building preferential flow pathways for soil surface water ( Edwards 2004 ), earthworms will shift the phenology of soil animal activity towards wetter seasons, intensifying the effects of warming and drought on ecosystem processes (H3; Fig. 2 F). Conceptual depiction of the main hypotheses. [A] Earthworms invade ecosystems in waves (see text). Those dynamics induce nonlinear alterations of communities and processes. We expect to observe a decline in the functional diversity of plant and soil communities [B], recovering a bit after the invasion wave. We expect to see a shift in soil energy channels from a more fungal to a bacterial- dominated system with lower mycorrhization rates [C]. Further, decomposition [D] and drought stress are hypothesized to increase and soil stability to decrease [E]. Earthworms (W) and warming (T) will interact in intensifying seasonal dynamics in soil biological acitvity [F]. The inset indicates a path analysis differentiating direct effects of T on processes (P) from indirect effects through changes in W. See text for details. 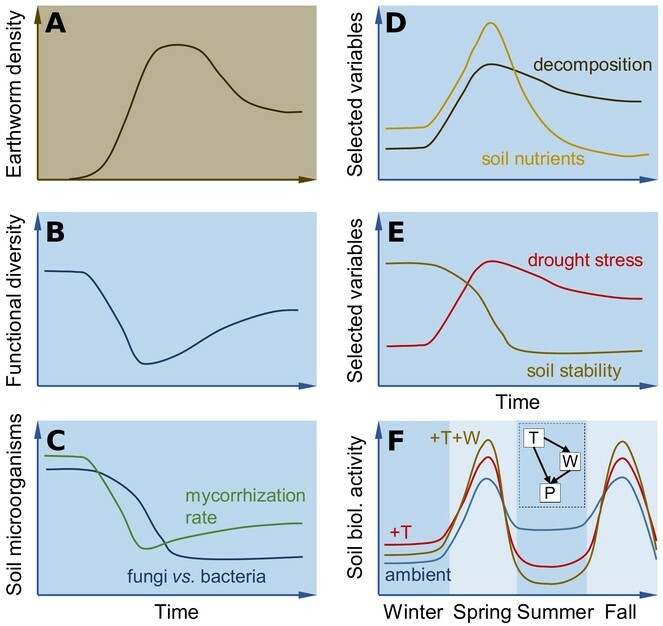 Shifts in the plant community can be due to various mechanisms (H4) including changes in soil microbial community composition, mutualistic interactions ( Fig. 2 C; Lawrence et al. 2003 ), changes in soil nutrient availability ( Fig. 2 D; Resner et al. 2015 ), decreased surface litter cover ( Fig. 2 D; Roth et al. 2015 ), increased drought stress ( Fig. 2 E; Dobson and Blossey 2015 ), decreased soil aggregate stability (and increased soil erosion) ( Fig. 2 E; Dobson and Blossey 2015 ), and direct interactions between earthworms and seeds ( Eisenhauer et al. 2010a, Forey et al. 2011 ). Those alterations will favor certain plant functional types, such as graminoids ( Frelich et al. 2012 ). By selecting for particular traits of plants and soil organisms and by facilitating plant invasion, exotic earthworms may cause invasional meltdowns (H5; Heimpel et al. 2010 ), habitat homogenization (H6; Eisenhauer et al. 2007 Eisenhauer et al. 2007 ), and ecosystem state shifts (H7; Eisenhauer et al. 2011 ). Importantly, we expect substantial differences between effects of different ecological groups of earthworms on all tested response variables (H8 ; Eisenhauer 2010, Eisenhauer et al. 2012b ), whereby endogeic earthworms will have the strongest effects on plant and soil communities ( Eisenhauer 2010 ). While anecic earthworms may exert weaker but significant effects on herbaceous plant communities (weak effects of epigeics), epigeic earthworms may have significant effects on soil communities (weak effects of anecics; Eisenhauer 2010 ). As effect sizes will also vary among earthworm species within ecological groups, we will focus on four representative species that are commonly used as fishing bait in Central Minnesota and/or impactful invaders in northern North America ( Hale et al. 2006, Eisenhauer et al. 2014a , http://www.nrri.umn.edu/worms/default.htm). However, different earthworm species might facilitate each other, and the invasion by all three ecological groups may cause synergistic effects on ecosystem properties (H9; Hale et al. 2008 ). The relative magnitude of effects of exotic earthworms may differ from place to place depending on the functional dissimilarity between native soil fauna and the exotic earthworms (H10; Heemsbergen 2004, Wardle et al. 2011 ). To test this hypothesis, we will hold an international workshop during which we will synthesize a global earthworm dataset for the first time, and also develop novel collaborations among leading and junior scientists in this cutting-edge field of research. For the FO, three transects will be established perpendicular to the invasion front by setting up five plots per transect for i) noninvaded areas, ii) areas invaded by epigeic earthworm species only, and (iii) areas invaded by all three ecological earthworm groups ( Fig. 3 , right panel; Eisenhauer et al. 2007, Schlaghamerský et al. 2014 ). Typically, forests are being invaded by epigeic earthworms first (fast colonizers), followed by endogeics and anecics several years later ( Fig. 3 , right panel; Eisenhauer et al. 2007, Schlaghamerský et al. 2014 ). This will sum up to 15 replicates per invasion status per forest (45 observation plots per forest; plots 1 x 1 m). All plots will be permanently marked to allow for repeated measurements as done previously ( Straube et al. 2009 ). In order to derive general patterns, we will use the same setup in four spatially independent forest: two aspen forests in Kananaskis Valley, Alberta, Canada ( Eisenhauer et al. 2007, Eisenhauer et al. 2009a ) and two sugar maple forests in Minnesota and Wisconsin, USA ( Eisenhauer et al. 2011, Schlaghamerský et al. 2014 ), which will add up to 180 observation plots in total. Experimental design. (Right panel) One forest patch (four spatially independent patches in total) with invasion fronts of epigeic earthworms (orange) and endogeic and anecic earthworms (yellow) present. Three transects à 15 observation plots (1 x 1 m; Eisenhauer et al. 2007 ) will be established. In the area without earthworms, a field experiment will be set up with experimental plots (Left panel), five treatments, and six replicates. PVC shields will be used to establish earthworm enclosures of 1 x 1 m ( Eisenhauer et al. 2009b ). Phytometers will be planted in all observational and experimental plots ( Eisenhauer et al. 2009b ). In addition, intact soil cores will be taken and brought to the lab for seed addition experiments ( Whitfeld et al. 2014 ). The two aspen forests are located ~5 km apart in Kananaskis Valley in the front range of the Canadian Rocky Mountains in southwest Alberta at about 1410 m above sea level. The dominating tree species in both forests is trembling aspen (Populus tremuloides) interspersed with balsam poplar (Populus balsamifera). The understory is dense and mainly consists of herbs (see Eisenhauer et al. (2009a) for species list). The soil was classified as orthic grey luvisol, and the climate is characterized by long, cold winters with intermittent warm Chinook winds and short dry summers ( Eisenhauer et al. 2009a ). The soil usually remains frozen from November until March. The mean annual precipitation at the study site is 625 mm and the mean annual temperature in the organic layer is 3.8°C. The other two sites are located 250 km apart in northern Minnesota (Chippewa National Forest) and Wisconsin (Chequamegon section of Chequamegon-Nicolet National Forest), USA. Both study sites are covered with mesic forests approximately 80-100 years old after logging in the early 1900s, and are dominated by sugar maple (Acer saccharum) on deep, well-drained, light-colored sandy loams (Eutroboralfs on the Minnesota site and Fragiorthods and Haplorthods in Wisconsin). The climate is humid continental, cold temperate: annual precipitation 650 mm and 870 mm, mean January and July temperatures -15 and +20°C and -12 and +20°C at the Minnesota and Wisconsin sites, respectively. All four study sites were used in previously published studies of European earthworm invasion impacts on native plant community structure and some groups of soil organisms, and have clearly documented leading edges of earthworm invasion ( Eisenhauer et al. 2007, Eisenhauer et al. 2011, Straube et al. 2009, Schlaghamerský et al. 2014 ). Earthworm densities will be determined as done previously ( Eisenhauer et al. 2007 ). To study earthworm effects on the dominating tree species in a standardized way, we will for the first time transplant ‘phytometers’ in all observation plots ( Eisenhauer et al. 2009b, Eisenhauer et al. 2012a ). We will plant two individuals of balsam poplar into the 90 observation plots of the aspen forests and two individuals of sugar maple into 90 sugar maple plots (360 trees altogether, 180 per species). Tree saplings (height: ~50 cm) will be purchased from local tree nurseries ( Eisenhauer et al. 2012a ). In the area without earthworms, a novel, systematic field experiment will be set up with experimental plots of 1 x 1 m in all four forests mentioned above ( Fig. 3 , left panel). We will set up five treatments (control without earthworms, +epigeic [Dendrobaena octaedra], +endogeic [Aporrectodea caliginosa, Lumbricus rubellus; the latter being epi-endogeic], +anecic [Lumbricus terrestris], and +all three ecological groups) with six randomly located replicates each (30 plots per forest; 120 altogether). Earthworm densities will be established according to densities found at the peak of the invasion wave for each ecological group in each forest. Earthworms can easily be purchased as fishing bait in bait shops as ‘nightcrawlers’ (L. terrestris) and ‘angle worms’ (mix of L. rubellus and A. caliginosa) or collected in the field (D. octaedra). There are no ethical issues with this approach because we will select plots that are expected to be invaded by earthworms within the next five to ten years, and we have ample experience with manipulating earthworms in the field (e.g., Eisenhauer et al. 2008, Eisenhauer et al. 2009b ). Additional plots will be set up adjacent to the experimental plots to check if earthworms established successfully, which requires destructive sampling. Plots will be enclosed with PVC shields above- (20 cm) and belowground (40 cm; soil trenched before) to minimize the escape/colonization by earthworms ( Fig. 3 , left panel; Eisenhauer et al. 2009b ). Adhesive hook tape will be applied to the inside of the aboveground part of the PVC shields to keep earthworms confined to the open-top enclosures ( Lubbers and van Groenigen 2013 ). As done in FO, phytometers will be planted in all plots to measure earthworm effects using a standardized protocol. Following the design of the FE, 30 intact soil cores (diameter 20 cm, depth 40 cm) will be excavated in noninvaded areas of each forest and brought to the laboratory (University of Calgary for sites in Alberta and University of Minnesota for the sites in Minnesota and Wisconsin). The same earthworm treatments and the same earthworm densities per m² will be established as in the field. Afterwards, 10 common native and 10 common exotic and invasive plant species will be added as seeds as done before ( Eisenhauer et al. 2012b ). The abundance of these species will be determined during the FO. The experiment will run until germination rates saturate (~3 months; Eisenhauer et al. 2012b ). In each observational and experimental plot, yearly measurements of soil structure, soil pH, C and N concentrations ( Eisenhauer et al. 2007 ), and stability of soil aggregates ( Pérès et al. 2013 ) will be performed. Soil water and temperature will be measured during each sampling campaign to assess earthworm effects on microclimatic conditions in the topsoil (~5 cm depth). For the analyses of microorganisms, protozoa, and nematodes, five soil cores (diameter 2 cm, depth 10 cm) will be taken during each campaign, pooled in plastic bags, cooled, and brought to the laboratory to be processed following standard protocols. To assess soil microbial community respiration, biomass, and C and N limitations, we will use an O2-microcompensation apparatus ( Eisenhauer et al. 2010b ). To investigate microbial community structure and main energy channels in soil (e.g., bacterial vs. fungal biomass), we will perform phospholipid fatty acid (PLFA) analysis ( Scherber et al. 2010 ). Further, we will measure the activities of seven extracellular enzymes (1,4-β-glucosidase, cellobiohydrolase, 1,4-β-N-acetyl-glucosaminidase, phosphatase, peroxidase, phenol oxidase, and urease) being involved in C, N, and P cycles ( Steinauer et al. 2015 ) as well as the potential functional diversity of soil microbial communities by using BIOLOG Ecoplates (BIOLOG, Hayward, CA, USA) with 31 different carbon substrates ( Jousset et al. 2011 ). Further, numbers of protozoa (i.e., active and encysted forms of Amoebae, ciliates, and flagellates) will be determined using a modified most probable number method with fresh soil ( Eisenhauer et al. 2012c ). Nematodes will be extracted from fresh soil using a modified Baermann method and identified to genus level ( Cesarz et al. 2015 ). Soil nematodes are very informative bioindicators of soil conditions by allowing the calculation of the functional indices maturity index (disturbance), structure index (trophic complexity), and enrichment index (resource availability), as well as the ratios of fungal and bacterial feeders (soil energy channels) ( Cesarz et al. 2015 ), and of microbivores and plant feeders (net effect of soil organisms on plants; Thakur et al. 2014 ). The above-mentioned classical approaches to assess community composition and density/biomass will be complemented by cutting-edge sequencing approaches to complement with detailed data on biodiversity. In 2017 (FO) and 2018 (FE) the diversity and community composition of fungi, bacteria, archaea, protozoa, and nematodes will be analyzed using a multiple meta-barcoding based next generation sequencing approach ( Wubet et al. 2012 ) utilizing taxon-specific primers for a paired end sequencing of the microbial communities using Illumina MiSeq ( Caporaso et al. 2012 ). Subsequent analysis of the microbial community will be carried out using Mothur and/or QIIME microbial community analysis platforms. In addition, soil microarthropods will be extracted from soil cores using heat extraction ( Eisenhauer et al. 2007 ). Soil surface litter removal (as an important part in the decomposition process) will be determined by using litter bags ( Ebeling et al. 2014 ), and soil animal activity will be assessed via an improved bait lamina stripe test ( Fig. 4 B; Eisenhauer et al. 2014b ). Exemplary plot of the B4WarmED experiment (Boreal Forest Warming in an Ecotone in Danger) in Cloquet, MN, USA [A] ( Eisenhauer et al. 2014a ). Heat cables in the soil, heat lamps, and permanently installed retractable tarps systems are used to manipulate temperature (ambient, ambient +1.7°C, and ambient +3.4°C) and summer precipitation (ambient, ambient -45%) in a full factorial design at two locations (Cloquet, Ely). Preliminary results of bait lamina decay (measure of soil animal activity; Eisenhauer et al. 2014b ) in the different temperature treatments [B, modified after Thakur et al. (2018) ]. Soil animal activity was assessed every two weeks by counting the number of decayed baits. Inset: changes in soil water content. Photo credit: Nico Eisenhauer. Data on the taxonomic composition and the topological structure of soil food webs ( Thompson et al. 2012 ) will then be analyzed, main energy channels will be identified ( Eisenhauer et al. 2013 ), and soil food web data will be linked to data on soil processes, such as microbial respiration, litter decomposition, soil nutrient availability, and soil animal activity ( Ebeling et al. 2014 ). This will allow the investigation of soil biodiversity–ecosystem function relationships in realistic, nonrandom biodiversity change scenarios ( Cardinale et al. 2012 ). Further, potential shifts in soil invertebrate traits will be assessed ( Pey et al. 2014 ) and used to calculate functional diversity metrics ( Milcu et al. 2013 ). For soil food web analyses, interaction matrices will be built based on a literature search to explore the topological structure of soil food web networks ( Thompson et al. 2012 ). Phenology of soil animal activity will be assessed via repeated measurements of bait lamina stripes. Preliminary tests in preparation for this proposal have shown that this approach is very powerful in capturing experimental treatment effects (soil warming) on the phenology of soil animal activity ( Fig. 4 B). WPI will enable us to test hypotheses 1-3, 6-9, and to write at least five papers in international peer-reviewed journals on i) the responses of soil microbial communities and processes, ii) the topological structure of soil food webs, iii) the methodological approach of combining classical methods in the determination of density/biomass of soil organisms with cutting-edge sequencing techniques, iv) the phenology of soil biological activity, and v) soil BEF relationships. Multivariate statistical approaches, such as structural equation modeling, will facilitate the investigation of effects of different correlated explanatory variables to test multiple conflicting/parallel hypotheses (e.g., Eisenhauer et al. 2013, Ebeling et al. 2014 ). In each observational and experimental plot, we will perform yearly (August) assessments of understory vegetation composition (plant species-specific cover; Eisenhauer et al. 2007 ), and plant community productivity and structural heterogeneity will be assessed via a non-destructive photographic approach ( Proulx et al. 2014 ). To assess shifts in plant traits and their diversity, we will measure plant height, specific leaf area, and obtain seed mass data from the TRY database (www.try-db.org). Further, we will record signs of invertebrate herbivory ( Ebeling et al. 2014 ) and pathogen infestation ( Scherber et al. 2010 ). The phytometers will allow standardized and comparable analyses: we will record signs of tree uprooting and growth responses. Yearly measurements of N and C:N in leaf tissue will serve as a proxy for N availability for plants, and δ13C will be measured to infer drought stress caused by earthworms ( Eisenhauer and Scheu 2008 ). The seed addition experiment in the laboratory allows investigating if exotic earthworms influence plant germination and establishment in intact plant communities ( Eisenhauer et al. 2012b ). Measuring plant community biomass, soil surface litter, soil structure, soil moisture, and soil N availability will provide important information on the mechanisms underlying earthworm effects ( Whitfeld et al. 2014, Roth et al. 2015 ). The selection of plant species added as seeds will depend on the initial survey of the most common native and exotic understory plant species in the four different forests. WPII will test hypotheses 1, 4-9, resulting in at least five papers in peer-reviewed journals on i) the taxonomic and functional changes of plant communities along earthworm invasion fronts, ii) plant community responses to the presence of three different earthworm ecological groups, iii) the performance of tree saplings, iv) the germination and establishment of native and exotic plant species, and v) BEF relationships. For statistical analyses see WPI. For the analysis of BEF relationships it will be important to separate plant and soil diversity effects from other earthworm effects (e.g., changes in soil structure); therefore, earthworm density and biomass will be used as explanatory variables in structural equation models ( Eisenhauer et al. 2012b, Eisenhauer et al. 2012a ). The study will be conducted in the temperate-boreal forest ecotone of Minnesota, USA, in the framework of the B4WarmED experiment (Boreal Forest Warming at an Ecotone in Danger; Eisenhauer et al. 2014a ). This field experiment simulates climate warming in closed and open canopy areas at two different sites: Cloquet (coordinates: 46°31' N, 92°30' W) and Ely (coordinates: 47°55' N, 92°30' W). The mean annual temperature of Cloquet is 4.2°C with mean annual precipitation of 752 mm, whereas Ely has 3.6°C and 665 mm, respectively. The present experiment will be performed in open canopy areas where temperature (ambient, ambient +1.7°C, and ambient +3.4°C, randomly assigned) and precipitation (ambient, ambient -45%) have been orthogonally manipulated since 2012 ( Fig. 4 A). Both experimental sites in Cloquet and Ely (each with 18 plots, 3 replicates per treatment; 36 plots in total) are forested with 60-80 years old aspen overstory (P. tremuloides). Part of the aspen overstory was removed to create open canopy plots in 2006 at Cloquet and in 2007-2008 at Ely. At both sites, the soil is sandy loam, with higher variability in texture at Ely than at Cloquet. Both sites have been invaded by European earthworms ( Eisenhauer et al. 2014a ). Earthworms are likely to intensify effects of warming and reduced precipitation on plant and soil communities and processes ( Fig. 2 F; Eisenhauer et al. 2012b ). Earthworm densities are considerably higher in Cloquet than in Ely, which is why we expect earthworm effects to be stronger at the former site. Moreover, earthworm populations (four times a year; mustard extraction) and activity (every two weeks during growing season; number and weight of earthworm casts; Eisenhauer et al. 2014a ) will be assessed repeatedly. Phenology cameras (one per plot) will be installed to investigate potential shifts in the phenology of the understory vegetation, which can then be related to data on belowground phenology. As the efficiency of the mustard extraction method can depend on environmental conditions, such as soil water content, additional destructive samplings of the earthworm community will be performed outside of the experimental plots using hand-sorting and formalin extraction to i) verify the mustard extraction provided reliable information and ii) calibrate the earthworm activity assessment ( Eisenhauer et al. 2014a ). The bait lamina stripe method will be used to investigate soil animal activity every two weeks throughout the growing season. In preparation for this proposal, we tested an improved version of this method ( Eisenhauer et al. 2014b ) in the warming treatments of B4WarmED, which showed that it captures warming-induced changes in soil moisture and animal activity ( Fig. 4 B). This method will be complemented by repeated measurements of soil microbial activity (respiration and biomass, 6 times per year) and community composition (PLFAs, 2 times per year). Structural equation modeling will allow investigating effects of warming and reduced precipitation on soil communities and activities by considering the responses and effects of exotic earthworm communities ( Fig. 2 F, inset). WPIII will test hypotheses 1-4, resulting in at least two papers in peer-reviewed journals. In preparation of this proposal, we started creating a database of the effects of exotic earthworm invasion in North American forests on understory plant, soil invertebrate, and soil microbial communities by performing a search in the ISI Web of Science database using the keywords (‘earthworm*’) AND (‘exotic’ OR ‘invasive’). These words were selected in order to include a wide array of studies addressing the effects of exotic earthworms on above- and belowground communities. From the initial list of 359 studies, we examined each title and abstract to determine if they met the inclusion criteria. Our inclusion criteria were: i) that the study was performed in a North American forest ecosystem, ii) reported density, biomass, or presence/absence of exotic earthworms (identified to species or earthworm ecological group), iii) reported the abundance of plant species or plant functional groups in the forest understory, iv) reported the diversity and composition of soil invertebrate and soil microbial communities. Subsequently, we communicated directly with authors of the selected articles to obtain raw data. Thus far, we identified 24 unique studies meeting our inclusion criteria with 567 observations (12 studies) for plant communities, 724 observations (13 studies) for abundance of plant growth forms, 15 observations (7 studies) for richness of soil invertebrate communities, and 8 observations (6 studies) for abundance of soil microbial communities ( Fig. 5 ). Studies on soil microbial communities, amphibians, and birds are rare (both <5 published studies) and could not be included in the meta-analysis. Location of study sites used in the meta-analyses to evaluate impacts of exotic earthworms on [A] plant and [B] soil invertebrate and microbial communities in North American forests. Each point corresponds to study sites (particular studies had multiple sites). Green: plant communities, orange: soil invertebrates, blue: soil microbial biomass. This database will be extended by contacting researchers and performing regular literature searches. The iDiv Biodiversity Informatics Platform will host the database and guarantee standardized data publication. Moreover, a workshop will be organized at the German Centre for Integrative Biodiversity Research in Leipzig, Germany (http://www.idiv.de/en/idiv-global) to assemble comprehensive synthesis datasets on the consequences of exotic earthworm invasion with the help of international scientists. While the observations and experiments in this proposal focus on North America, the workshop will address earthworm invasion as a global phenomenon ( Hendrix et al. 2008 ) and include data from different ecosystems. Synthesis work will investigate the overarching questions if exotic earthworm invasion i) causes habitat and community homogenization ( Eisenhauer et al. 2007 ) by calculating Bray-Curtis and Jaccard dissimilarity indices, ii) leads to state shifts in ecological communities ( Eisenhauer et al. 2011 ), iii) causes invasion meltdowns ( Heimpel et al. 2010 ), and iv) selects for particular traits in plants and soil organisms. The global dataset will allow to test if the relative magnitude of effects is determined by the functional dissimilarity between native soil fauna and the exotic earthworms. Further, this WP will synthesize the ecosystem responses to earthworm invasion measured in the framework of this proposal. The respective papers will test hypotheses 1 to 10 and may be published in general ecological, global change, and multidisciplinary science journals. N.E. thanks seven anonymous reviewers for their evaluations of this proposal and acknowledges funding by the European Research Council (ERC) under the European Union’s Horizon 2020 research and innovation programme (grant agreement no. 677232). Moreover, we acknowledge funding by the German Centre for Integrative Biodiversity Research (iDiv) Halle-Jena-Leipzig. The European Union’s Horizon 2020 research and innovation programme (grant agreement no. 677232). How do earthworms affect microfloral and faunal community diversity? Biodiversity loss and its impact on humanity. The unseen invaders: introduced earthworms as drivers of change in plant communities in North American forests (a meta-analysis). Plant diversity effects on soil microorganisms support the singular hypothesis. Will environmental changes reinforce the impact of global warming on the prairie–forest border of central North America? Exotic European earthworm invasion dynamics in northern hardwood forests of Minnesota, USA. 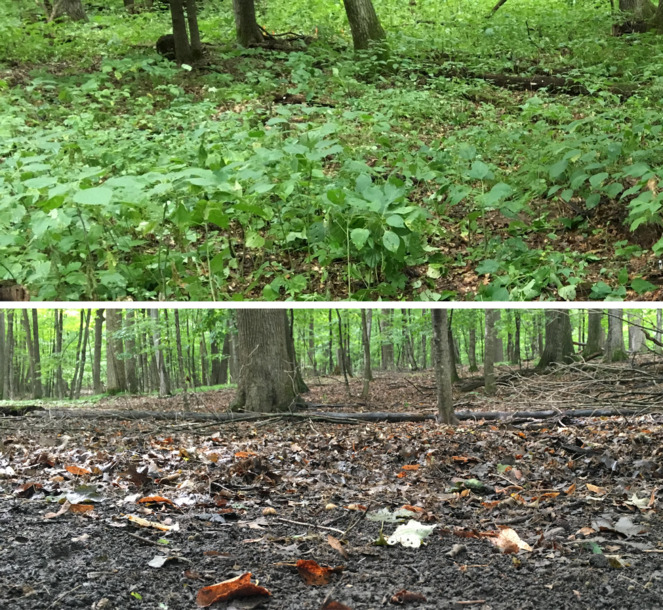 Changes in hardwood forest understory plant communities in response to European earthworm invasions. The effect of earthworm invasion on nutrient turnover, microorganisms and microarthropods in Canadian aspen forest soil. A meta-analysis of declines in local species richness from human disturbances. Terrestrial ecosystem responses to species gains and losses.